Sat Narayan Waheguru Hari Narayan Sat Nam. Narayan is the aspect of Infinity that relates to water. Hari Narayan is innovative sustenance, which makes the one who chants it healing. Sat Nam means Truth is His name. A daily practice of this mantra gives happiness, inner space, peacefulness, bliss and good fortune to the practitioner. Even a person with low self-esteem can become happy and relaxed by reciting this healing mantra. The words of the mantra invoke the different names of God to help bring prosperity, abundance, calm, peace of mind, and the inner power to look beyond this world to realize the Infinite in this lifetime. Kundalini mantras contain the vibrations of peace, connection, abundance, prosperity, and many other positive qualities and characteristics, and are understood by their percussion, even if the meaning of each Gurmukhi word is not known. 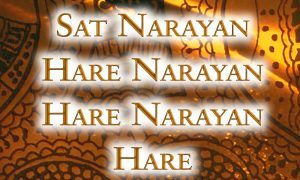 More importantly, using this chant in a mantra meditation session is considered as one of the most powerful methods to bring peace in your heart. This inner peace eventually gets dispersed all around you, and finally flows into the entire creation. Correct pronunciation of these soothing Kundalini Yoga words, vibrate different parts of the roof of the mouth, touching on meridian points (channel network), stimulating and balancing particular parts of the brain and the physical body, and listening (healing vibration) to the sound inside you, plus how many minutes or hours an individual chants the mantra, all these factors combined, will bring you safety to inner states of enlightenment (awareness) and change. This entry was posted in Kundalini Mantras on January 26, 2016 by admin.